The MOT test was designed to ensure your vehicle meets road safety and environmental standards and according to UK law, you must keep any vehicles driven on the road, in a road worthy condition. Once a car reaches 3 years old, it must have an MOT test and as a result, a valid MOT certificate to remain on the road, and it’s essential to have your vehicle tested again before the current certificate expires. The earliest date that you can have your vehicle retested will be printed on the MOT certificate. If caught whilst driving your vehicle with no MOT you will be prosecuted. The only exception is if you are on your way to the test centre, for a booked MOT. The MOT test only outlines the minimum legal standards that your vehicle must meet, it is not a guarantee of its mechanical condition. It is essential to have your car serviced regularly to keep it in good condition. Find out more about the difference between the MOT test and car servicing with our helpful guide. 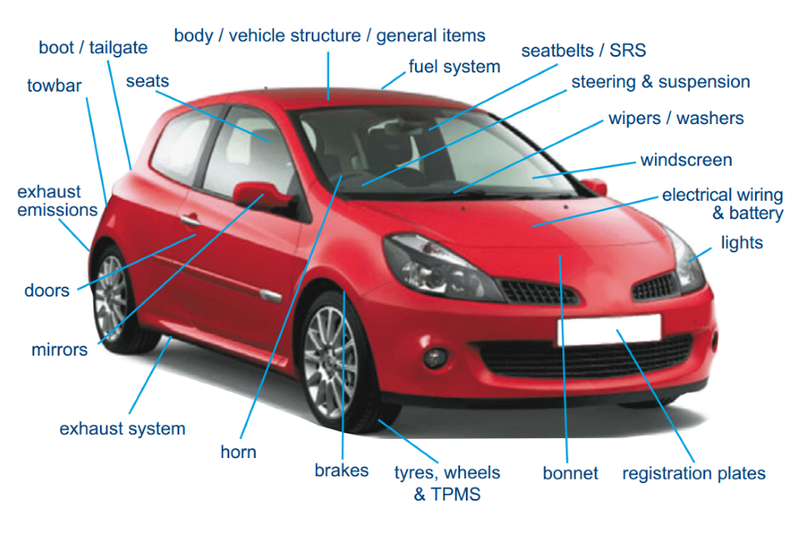 The image above from the UK government advisory publication shows what will be checked and inspected during your MOT test. Below is a brief list as to what you can expect from the MOT test. Defects: defects are now split out into 3 different categories – dangerous, major and minor. The only way a defect can allow a car to pass its MOT is if the defect is classed as minor – both dangerous and major defects result in a fail. Diesel car emissions: the rules have tightened on emissions for diesel cars with the introduction of a diesel particulate filter (DPF). This captures exhaust soot, reducing emissions. However, if the DPF has been tampered with, or smoke is coming from the exhaust, your car will fail its MOT. MOT certificate: this is now in a different format, listing the defects more clearly. 40+ year old vehicles: if they have not been substantially changed and they are over 40 years old, these vehicles will no longer need to have an MOT. There are other smaller changes that have been added to the MOT checklist, but your local Setyres MOT garage can explain these smaller tweaks if required. The body of your car should be free from excessive corrosion and damage in specific areas, and there should be no sharp edges likely to cause injury to other motorists or pedestrians. Towbars will be checked if they are fitted, for security and to ensure they are in an appropriate condition for effective use. The car's body and structure of your car will also be checked for inappropriate repairs or modifications. It is important that the operation of the electrical socket is working correctly. Another essential element that will also be tested is the speedometer condition and operation, as are the engine mountings. Towbars will also be checked if they are fitted, for security and to ensure they are in an appropriate condition for effective use. The fuel system on your car will be checked to ensure there are no leaks, as well as the security and condition of all fuel pipes and hoses that are essential to the safety of your vehicle. A fully locking fuel cap must be fitted, in order for your car to pass its MOT test so if you have a temporary one fitted, make sure it does lock. The fuel cap will need to be opened during the MOT test so it is vital that the key is available. 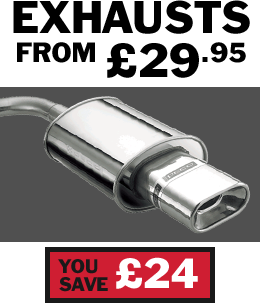 The exhaust emissions that your vehicle gives off will be tested to ensure they meet the legal requirements. The levels differ depending on the age and fuel type of the vehicle. The exhaust system itself must be secure and complete. If your catalyst is missing, but there was once one fitted as standard this will result in a test fail. Overall the system must function without serious leaks and meets the required noise limits too. Your car must have all seat belts fitted; they will be checked for type, condition, operation and security. All mandatory seat belts must be fitted. A check will be made on the Malfunction Indicator Lamp (MIL) for air bags and seat belt pre-tensioners and load limiters. The driver’s seat must be fully adjustable. For security, all seat backs should be able to be secured in the upright position. All doors on your car must latch securely in a closed position. The front doors should open from both the inside and the outside of the vehicle. It is essential that the rear doors should open at least from the outside. The hinges and catches will be checked for security and condition. It is essential that your tyres meet the legal requirements. The condition and security of your tyres will be checked; Your car must have the correct tyre size and type fitted and the tread depth must meet the legal minimum of 1.6mm and should also be inflated to the correct pressure. Vehicles first used on or after 1 January 2012 will undergo a check of the MIL for the Tyre Pressure Monitoring System (TPMS) too. You must ensure your car has a driver’s side mirror and an internal rear view mirror, to pass the MOT test. They must be in good condition and fixed soundly. Your windscreen wipers must fully operate to ensure a clear view ahead. This is the same for your washers, ensure the reservoir has sufficient wash in before the MOT test, so this can be tested. The condition of the windscreen itself will be inspected to assess your view of the road. There must be no damage more than 40mm in size across Zone A, or the swept area of the windscreen – this is the Area from top to bottom right in front of the driver. The condition of your car brakes is always vital to this check and will include seeing if there are any inappropriate repairs or modifications to the brakes which will affect operation or performance. If your car has Anti-lock Braking System (ABS) or Electronic Stability Control (ESC) this will also be checked. As will the dashboard Malfunction Indicator Lamp (MIL) for both ABS, ESC, electronic park brake and brake fluid warning. The condition and operation of your steering and suspension systems, including steering oil level will be completed by your MOT tester. Any inappropriate repairs or modifications will be identified as will any corrosion to power steering pipes or hoses. The steering lock mechanism must be in full working order and the MIL for electronic power steering and steering lock will also be checked as part of the MOT. All of your car lights must be in full working order. Their condition must be good and they must all function on demand. This includes the registration plate light. Make sure any bulbs that are missing or not working are replaced before the MOT test. Bonnet: This should securely latch in the closed position. Horn: Should be in correct operation and of suitable type. Registration plates: Make sure your plates are in good condition, the right colour and the characters are correctly formed and spaced. Load security: The boot or tailgate must be secured in the closed position. Electrical: Any visible electrical wiring and your car battery must be working, undamaged and secure. For more information on the MOT test call your nearest Setyres branch, our expert staff will be happy to help with any questions you might have. Now you know what gets checked in an MOT, book your MOT test at your local Setyres branch.